The glorious day has dawned. 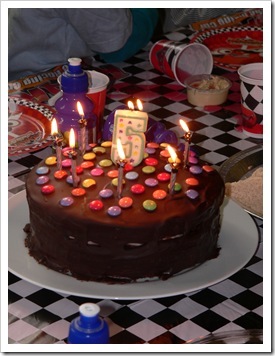 My lovely godson Luca – thinker, bicycle speed merchant, keen gardener and chocolate connoisseur – is no longer ‘Nearly five!’, he’s really five. Every year, I make his birthday cake, a tradition I plan to continue long after baked offerings from his Auntie D will embarrass his cool, adult self. I’ve just got back from France, so no time this year for elaborate confections of imaginative shape and refined decoration. Instead, I majored on chocolate, one of Luca’s favourite things in the world, along with frogs, cars and water pipes. There are lots of things I love about Annie’s simple-to-make but impressive-to-eat cake. The buttermilk, vinegar and bicarb combination makes it wonderfully light for a start. Also, the easy, pourable icing takes minutes to make and looks wonderfully glossy on the cake. In her grown-up version, she dips amaretti biscuits into melted chocolate for decoration – a delicious and sophisticated final flourish. Preheat the oven to 180C/350F/Gas mark 4. Butter three 22cm/9in cake tins with removable bases and line the bases with circles of baking parchment. Butter the paper. Cream the butter and sugar together in a mixer until very light and fluffy – about 6 minutes. Add the eggs, one at a time, beating well between each addition and scraping down the bowl after each egg. Stir in the flour in three stages, alternating with the buttermilk and ending with the last batch of flour (flour/buttermilk/flour/buttermilk/flour). Add the salt, vanilla extract and cocoa. In a small bowl, mix together the vinegar and bicarb – it will fizz quite a bit – then add this to the batter too. Divide the mixture equally between the three tins, smooth gently with a spatula and bake for 20-25 minutes until the cakes shrink from the sides slightly and a cake tester or toothpick inserted into the middle come out clean. Leave to cool for 10 minutes then turn the cakes out onto a wire rack, remove the paper and cool completely. While the cakes are cooling, make the filling by beating together the mascarpone and raspberry jam until smooth. Chill slightly. When the cakes are completely cool, sandwich them together with the creamy mixture. To make the icing, melt together half of the chocolate and butter in a small pan over a low heat, stirring until smooth, the stir in a tablespoon of the coffee if you’re using it. 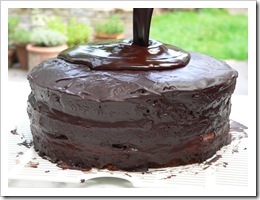 Put the cake on a rack and pour over the icing, smoothing it over the sides with a palette knife as you go. Leave it to set for an hour and then repeat with the remaining half of the ingredients, this time pouring over the icing and smoothing it onto the cake as lightly as possible with the palette knife to ensure a nice, glossy coating. Arrange the Smarties over the top and leave for another hour to set. Transfer to a cake plate or board. If you like, you can store the cake in an airtight container in the fridge for a couple of days, but bring it back up to room temperature for half an hour before serving. Miss LY – I love that in the picture too, so of the moment! Miss BG – Oh, you’re so welcome. Always. See you tomorrow for le birthday part deux. Alisa – Thank you! And I’d love to have Foodista readers visit. Zoe – You and me both. Isn’t it heaven? Thank you for visiting. Delicious! Anything with mascarpone gets my attention! What a delicious cake! And Luca is just so lucky to have you!Hope you wont mind but I’d love to bring over < HREF="http://www.foodista.com/" REL="nofollow">Foodista<> readers to your site, just add this little widget < HREF="http://www.foodista.com/recipe/GFM2ZMGY/chocolate-cake/widgets/" REL="nofollow">here<> to this post and it’s all set to go, Thanks! My favorite part is the spilled birthday punch…talk about love! No fussing to hustle and clean it up before the photo is snapped. Now THAT’S a happy birthday! Catherine – Isn’t he though? Lady P – Give it a go! I think you’d like it. A perfect, cheering project for a rainy day in Washington State. Scarlett – You know what would be marvellous on this cake later in the year? Some juicy raspberries or strawberries from your gorgeous allotment. And I AM lucky. Luca’s a doll – he’s Vixter’s little boy. Mariana – If I’d had time, I might have done three thin coats, or trimmed the cake properly so it was more smooth, as there are still a few little gaps between the layers, but no matter. Perfection can be very dull. I have a double oven so did two cakes in one and a third in the other, but in Annie Bell’s book, she suggests (for those who only have two same-sized tins) baking two of the cakes, removeing them from the tins, then filling one tin with the rest of the batter and baking that separately, so I think you could do that. On the butter question, I use unsalted butter for everything, but I think you could use salted butter and perhaps a pinch of salt instead of the 1 1/2 tsps – I’d taste the batter (who needs an excuse?) and see how much extra you think it needs, if any. Happy baking! Your cake stands tall and proud Debora, as indeed it should. Love the idea of icing it twice. It clearly works as you have achieved a smooth, glossy shine all over. Just gorgeous. Is your oven huge? I would be flatout trying to bake three cakes at once. I’d most likely bake one or two and then split them. Do you think it would matter if I just used salted butter and left out the added salt? Oh my goodness – yummy yummy yum yum chocolate-yummy heaven! I would lose the smarties (only because I boycott Nestle) and use chocolate buttons instead – MORE chocolate !! Dear Ms Spoon – you are indeed lovely – thank you for the visit and the kind, resonating words – and for the colorful promotion I see as well! 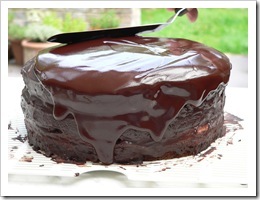 I really must say that I am very fond of your palette and that chocolate cake is calling to me “bake me bake me”! Oh my word, this looks delish! I am sure he will never tire of you baking his birthday cake. Will you bake me one for my birthday too, please, pretty please? What a lucky little boy…who just happens to be absolutely adorable! Girlichef – Thanks! I was just thinking that this would make wonderful cupcakes too. Use the batter to make cupcakes, remove from cases, cut in half horizontally and sandwich together with some raspberry-mascarpone cream. Pour chocolate icing over, pop a fresh raspberry on top, allow to set then put into pretty cases. I just made myself hungry. Penny and Fran – Thank you! You know, when my best friend Victoria first met Luca’s gorgeous dad, we all struggled to pronounce his name (he’s Portuguese, he’s called Helder. Not so difficult I know, but we had drunk quite a lot of champagne that evening), so we all just called him Handsome H. And lucky Luca’s inherited not just his daddy’s good looks, but his sweet nature too. Lady P – I knew this would appeal to you, oh Queen of Colour (see, I just promoted you). And you’re right, Smarties are always appropriate, whatever your age. Clare – I think the amaretti would be yum, but I have to say the Smarties were pretty good and they look so happy. 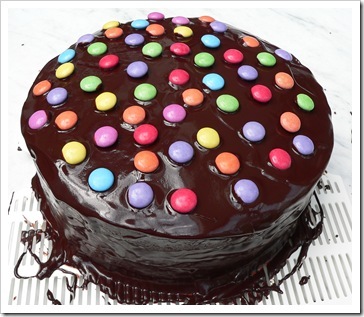 Yum – what chocolate decadence and easy enough to make – and of course, the colorful smarties must be used for even us adults! 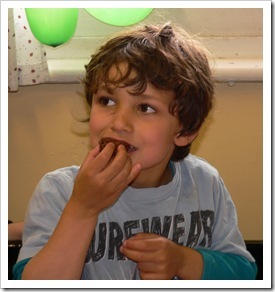 Lovely pics of the cake and what a handsome young lad! Beautiful cake Debora and handsome godson.